Embedded DVRs do not use a Windows operating system. In fact, there is no software at all on the hard drive. All functions are contained (embedded) on software encoded computer chips. View in real time. Easy setup. 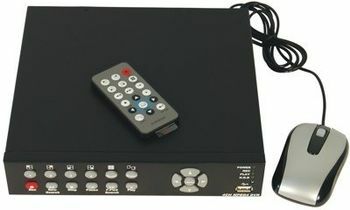 The Embedded series Digital Video Recorders (DVR) operate just like a VCR. However, they have many features that make them more powerful and easier to use than even the most advanced VCR. This model also allow you to playback video through your smart phone! These DVRs converts analog video (NTSC or PAL) to digital images, and records them on a hard disk drive. Using a disk drive allows users to access recorded video almost instantaneously without having to rewind or fast forward tape. There is no need to adjust tracking. You can freeze frames and forward or rewind without image streaking or tearing. Digital video can be indexed by time/date or events, and users can instantly view video after selecting the time/date or event. The rear panel provides convenient connection for video and audio input/output. All DVR functions controllable through remote access, 4 record quality settings, a Manual/scheduled/motion detection recording, Video Motion Detection, Video Loss Detection, 2 year warranty. Features: H.264 Video Compression and Network Streaming, Multi-Lingual, USB Backup, Remote setup, monitoring, backup, alarm notification, remote software upgrade, multiple DVR consolidation, system configuration, support Windows 7, Vista, XP, and 2000, Internet Explorer/Firefox/Chrome/Safari: Remote monitoring, Programmable HTTP / Control / Data port, Mac OS supported for remote viewing. This system also works with smart phones including: iPhone, Blackberry, and Android. Specifications: Video Format = H.264, Video Input = 4 CH composite BNC, Video Output = VGA & Composite BNC, Audio In = 1 CH RCA, Audio Out = 1 CH RCA, Storage= 500 GB HDD, Resolution = 720 x 480 (NTSC), 720 x 576 (PAL), Display Rate = Real Time 120 fps, LAN Connector = RJ45, Power= 12 V, Dimensions = 8 1/2" x 8" x 11/2"